RYLA 2018 Conference is fast approaching - are you ready ? Applications: Close 8th December 2017 (unless ALL 70x positions are filled before hand). Provide an opportunity for young people to develop a network of resources to facilitate their roles and development. Facilitate learning about teamwork, communication, motivation and to develop the leadership skills of young people through experiential workshops. Demonstrate Rotary's commitment to young people. Everyone’s experience of RYLA is unique. What you can expect though, is to meet people from a wide range of backgrounds and experiences, and to hear from a series of speakers, all with different perspectives on leadership, personal development and community. Some speakers will challenge you and what you believe, but hopefully some will also connect with you, or inspire you. RYLA assumes that 'leadership' is a diverse and varied concept and any one form or style of leadership is not seen as more important than any other. Intending candidates please note that as this conference is a week long, selected candidates must be able to commit to the full conference. In addition for those working candidates it is essential that you seek release from your employer. As Applications close mid 8th December , keep an eye out on our Face book and search on the above links around late October but remember you need to contact Engadine Rotary for endorsement and subsidy. Regretably we did not receive any applications in 2017. The 2016 RYLA conference was also held at Yarramundi and attended by 71 representatives from Rotary Clubs in the Rotary District 9675 (Sydney Southern area) over the week 2nd – 9th January 2016. 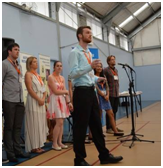 Engadine’s 2016 RYLA Representative was Patrick Wagner who after attending 2016 conference, decided to become a full member of the Rotary Club of Engadine.